Citation: Tamburini N (2017) A Rar e Case of Solitary Rib Me tastasis Thirty-Two Years after Resection of Parotid Gland Adenocarcinoma. Insights Chest Dis 2:12. Context: Parotid adenocarcinoma is a rare salivary gland neoplasm, showing distant metastases in 12%-26% of cases, according to histologic grade. The most frequent locations are the cervical lymph nodes, liver, lungs and bones and metastatic disease is usually associated with poor prognosis. Single late-onset rib metastasis from adenocarcinoma of parotid gland has never been reported in the literature. Case report: We describe the case of a sixty-three-years-old male presenting with an osteolytic rib lesion 32 yrs after surgery for parotid gland adenocarcinoma. The patient was successfully treated with en bloc resection of the 11th rib for parotid gland adenocarcinoma metastasis. The patient has no evidence of local recurrence or metastatic disease 40 months after resection. Conclusion: This case may be useful for making clinical decisions because underlines the challenges of giving patients the optimal treatment considering the limited ability to predict prognosis and highlights the need for careful follow-up even in absence of recurrence for 10 yrs after curative resection. Salivary glands cancers are a rare disease and represent 3% to 6% of all head and neck cancers and 0.3% of all malignant neoplasms. These tumours occur in the major salivary glands, including the parotid, submandibular and sublingual glands and in the minor salivary glands located in the upper aerodigestive tract. Parotid gland carcinoma is the most common and accounts for 1% to 3% of all head and neck carcinomas and for 75% of all malignant tumours of the major and minor salivary glands. The World Health Organization (WHO) Classification of salivary gland tumors includes 10 benign and 24 malignant histopathology’s of epithelial origin and many histological types contain subtypes. The rarity and heterogeneity of salivary gland carcinomas generates challenges regarding to the histological diagnosis, treatment and outcome. The prognosis of patients with metastatic parotid gland adenocarcinoma is usually poor with a reported 10-yr survival rate of 50% . According to the literature the incidence of distant metastasis after parotid gland carcinoma treatment ranges between 12% and 26% and salivary duct carcinoma and adenocarcinoma represent the two histologic sub-types which more frequently develop distant metastases, respectively in 52% and 43% of cases . Bone metastasis usually occurs in association with other extensive metastases and secondary isolated rib involvement by parotid gland tumor has never been reported in the literature. This report describes a patient with parotid gland adenocarcinoma who underwent resection of 11th rib metastasis 32 yrs after curative resection of the primary tumor. A 63-yr-old man was admitted to our Institution for a symptomatic rib lesion in the right chest wall. In his medical history, it was determined that in 1970 he underwent a left superficial parotidectomy for parotid adenocarcinoma. Postoperatively he was treated with radiotherapy (RT) to the left parotid area for adjuvant setting. In 1979 he underwent total parotidectomy, radical cervical lymph node dissection with facial nerve preservation for recurrence with skin involvement. He was not given any adjuvant treatment and he was followed-up on a routine outpatient basis for a ten-year period. 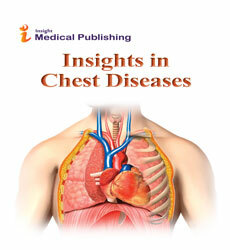 In 2012 the patient noted a right chest pain. On physical examination there were no palpable lymph nodes in the parotid region or chest tumefactions. Routine laboratory examinations, including tumor makers such as serum cancer embryonic antigen (CEA) and serum prostate specific antigen, were normal. Chest X-ray showed a focal swelling of the 11th right rib due to a poorly delineated osteolytic lesion and chest computerized tomography (CT) revealed a 2 cm diameter lesion with cortex erosion in the right 11th rib (Figure 1). Figure 1: Chest CT scan showing lesion with cortex erosion in the right 11th rib (arrow). Systemic bone scintillation scan revealed an elevated standard uptake value in the anterolateral aspect of the right eleventh rib (Figure 2). 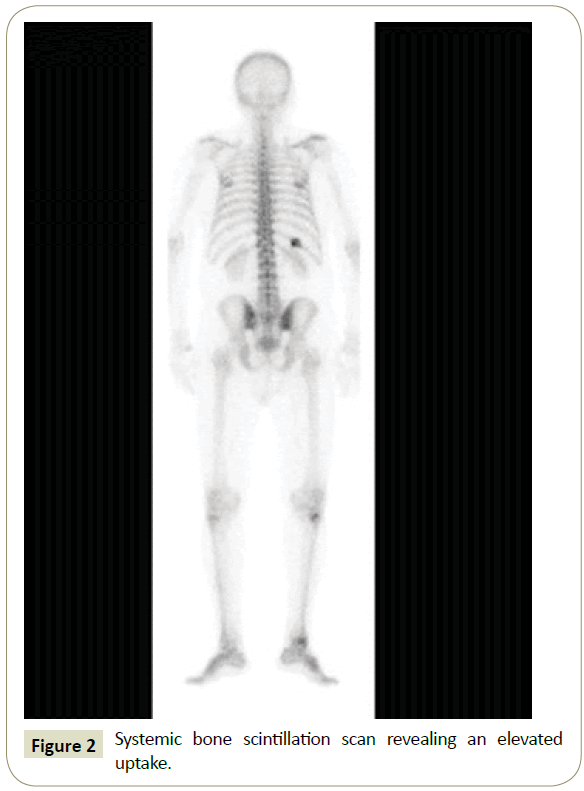 Figure 2: Systemic bone scintillation scan revealing an elevated uptake. The risk of tumor spread led us not to search for preoperative histological proof, especially because the resection was supposed to be complete. In January 2013 tumor resection was carried out en bloc, along with the 11th rib, adjacent intercostal muscle and surrounding tissues. Postoperative course was uneventful. The resected specimen showed a tumor measuring 1.8 cm without invasion of the surrounding intercostal muscle. Histopathological examination of the resected specimen revealed rib bone tissue infiltrated by neoplastic process consisting of solid, trabecular, ductular formations and small tubular structures characterized by distinct central lumens lined by a single layer of cuboidal cells and surrounded in abundant stroma. The tumor cells were monomorphic, round to polygonal with a scant amount of eosinophilic cytoplasm. Mitoses were rare and atypical mitoses and necrosis absent (Figure 3). Figure 3: Histological staining (10X magnification) of the resected specimen. The patient did not receive adjuvant chemotherapy and over a period of 60 months after the second surgery. CT and PET showed no evidence of recurrence; therefore, close follow-up has continued. Clinical stage and tumor histology are the two most important prognostic factors in parotid gland malignancy . The rarity of individual tumor histological subtypes has led investigators to group various histopathology’s into clinical categories based on behavior: the carcinomas of salivary origin therefore can be considered to behave biologically according to the grade of the tumor, ‘high-grade’ and ‘non-high-grade’ malignancy, regardless of the specific histologic diagnosis. In addition, other prognostic indicators are age, surgical resection margin and lymph node metastasis. The incidence of distant metastasis from parotid gland neoplasms ranges between 24% and 35% . Gallo et al. analyzing 124 parotid neoplasm cases found distant metastasis in 26.6% of cases, the commonest site of distant metastases was the lung 75%-90%, followed by long bones, liver, and brain. In a series of 103 parotid cancer patients treated and followed up over a 40-yrs period the incidence of distant metastases was 24.2% (16% Lung, 5% bone and 4% brain) . However, these studies did not report the incidence of isolated bone metastasis. Major salivary glands adenocarcinoma not otherwise specified (NOS) is a relatively uncommon finding, it constitutes 4.3% to 17.8% of salivary malignancies and shows an overall annual incidence of 0.122/100.000 [6,7]. Major salivary glands adenocarcinoma not otherwise specified is highly aggressive and often shows local recurrence or distant metastasis with poor survival: a large patient population analysis based on Surveillance, Epidemiology and End Results (SEER) national cancer database showed parotid adenocarcinomas with a 5-yr survival of 65.9% and a 10-yr survival of 49.7% . Therefore, salivary gland tumor survival should not be reported in terms of 5-yr survival but should be reported more in longer period of 15 yrs to 20 yrs. The reasons for recommending this long patient observation period are that the risk of locoregional recurrence and the development of distant metastases remains a possibility [8,9]. Each patient should have a routine X-ray of the chest, supplemented when necessary by a computed tomography (CT) scan of the thorax. It is generally advocated that all primary rib neoplasms should be treated by complete en bloc excision with wide surgical margins but the evidence for optimal management for these metastatic malignancies is lacking mainly due to the rarity of the disease. Warzelhan analyzed 82 patients after chest wall resection for metastatic disease and reported local control and pain relief and substantial long-term survival especially after local recurrence of breast cancer . Assouad et al. showed a series of six patients with isolated rib metastases from renal cell carcinoma with an overall five and ten-year survival rates were respectively, 83% and 66.7%. According to the international literature, an isolated rib involvement, in the absence of locoregional recurrence after achieving a complete response to aggressive multi-modal treatment, with surgery and radiotherapy has been never reported. The role of surgical management of metastasis is weak and parotid tumor with bone metastasis has not usually indicated for surgery. This case highlights the challenges of treating these patients and other patients with metastatic disease and also demonstrates the value of long-term follow-up. We believe that the limited, skeletal only location for late recurrent disease could be a positive prognostic factor that could have given a survival advantage for this patient. Patients with oligometastases or limited lesions may represent a population would benefit from more aggressive treatment with curative intent. Bhattacharyya N, Fried MP (2005) Determinants of survival in parotid gland carcinoma: a population-based study. JAMA Otolaryngol Head Neck Surg 26: 39-44. Ali S, Bryant R, Palmer FL, DiLorenzo M, Shah JP, et al. (2015) Distant Metastases in Patients with Carcinoma of the Major Salivary Glands. Ann Surg Oncol 22: 4014-4019. Vander Poorten VL, Balm AJM, Hilgers FJM, Tan IB, Loftus-Coll BM, et al. (1999) The development of a prognostic score for patients with parotid carcinoma. Cancer 85: 2057-2067. Gallo O, Franchi A, Bottai GV, Fini-Storchi I, Tesi G, et al. (1997) Risk factors for distant metastases from carcinoma of the parotid gland. Cancer 80: 844-851. Renehan AG, Gleave EN, Slevin NJ, McGurk M (1999) Clinico-pathological and treatment-related factors influencing survival in parotid cancer. Br J Cancer 80: 1296-1300. Boukheris H, Curtis RE, Land CE, Dores GM (2009) Incidence of carcinoma of the major salivary glands according to the WHO classification, 1992 to 2006: a population-based study in the United States. Cancer Epidemiol Biomarkers Prev 18: 2899–2906. Bjørndal K, Krogdahl A, Therkildsen MH, Overgaard J, Johansen J, et al. (2011) Salivary gland carcinoma in Denmark 1990-2005: a national study of incidence, site and histology. Results of the Danish Head and Neck Cancer Group (DAHANCA). Oral Oncol 47: 677-682. Bradley PJ (2001) Distant Metastases from Salivary Glands Cancer. ORL J Otorhinolaryngol Relat Spec 63:233-242. Jones AS, Beasley NJP, Houghton DJ (1998) Tumours of the minor salivary glands. Clin Otolaryngol 23: 27-33. Warzelhan J, Stoelben E, Imdahl A, Hasse J (2001) Results in surgery for primary and metastatic chest wall tumors. Eur J Cardiothorac Surg 19: 584-588. Assouad J, Masmoudi H, Berna P, Steltzlen C, Radu D, et al. (2010) Isolated rib metastases from renal cell carcinoma. Interact Cardiovasc Thorac Surg 10:172-175.